Michael Meadows and Daniel Lloyd shared the victories in rounds five and six of the Porsche Carrera Cup GB at Thruxton on April 29, as dreadful weather conditions made it one of the toughest race days in the 10-year history of the Carrera Cup. The victory for Carrera Cup Scholarship winner Daniel Lloyd in round six followed a terrific race between the identical 450 hp Porsche 911 GT3 Cup race cars, the drivers battling it out with a combination of slick racing tyres and a wet track. Meadows drove a superb race as heavy rain and wind made for a truly challenging opening race, the fact that every car finished unscathed was testament to the skill of the drivers. That remarkable achievement was repeated later in the day to the enormous credit of every driver on the Carrera Cup grid. Ahmad Al Harthy claimed the first of two Pro-Am1 wins, while Tania Mann bagged maximum points in Pro-Am2 after her first experience of racing in the rain. With the track awash, the race started behind the Safety Car to allow drivers to explore the conditions. After three laps, the pace car peeled off into the pit lane and the race started in earnest. Richard Plant (Sheffield) got the jump on Meadows (Banbury) and was actually ahead before they reached the start line, but Meadows bided his time and edged by as they raced through the Complex on lap eight. Butcher revelled in the rain to claim a deserved overall podium from starting sixth on the grid. “That was worse than Knockhill,” the Scotsman said of the conditions after a first class performance. Plant battled home fourth, which was scant reward for his early race pace. Like Plant, Daniel Lloyd (Huddersfield) had to contend with no front splitter which affected the car’s handling in the fast corners, but he still claimed fifth at the flag. Al Harthy (Oman) always set the pace in Pro-Am1 and took sixth overall as well as a resounding category victory. He spent many laps tracking Chris Dymond (Brackley) and finally worked ahead on the final lap. “I think I was faster than him, but I just couldn’t see anything,” said Al Harthy. Further back, Oly Mortimer (Edinburgh) battled hard to take second in Pro-Am1 after a lengthy challenge from Victor Jimenez (Spain). “It wasn’t the amount of grip that was the problem, it was the standing water,” said Mortimer. 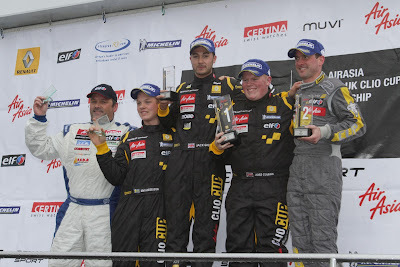 Jimenez lost his splitter later in the race, but the chasing Derek Pierce (West Kilbride) suffered the same problem and was not able to challenge the Spanish driver for the final Pro-Am1 podium place. “That was my first race in the rain: I couldn’t see a thing,” said Mann (Shenfield) after she coped remarkably well in the conditions to stay in touch with the Pro-Am1 cars and claim another Pro-Am2 maximum score. 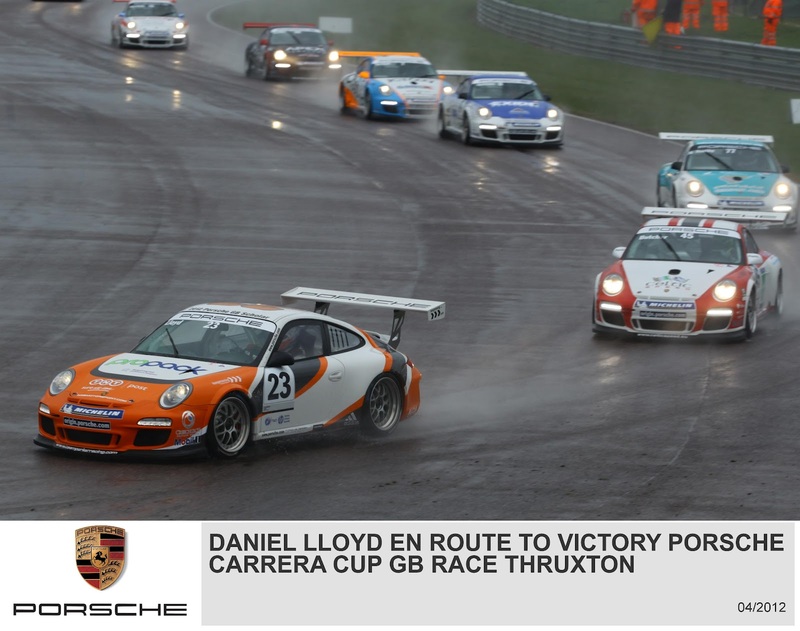 Lloyd scored a stunning debut Carrera Cup GB victory in a thrilling round six. In a race of ever changing fortunes, run with tread-less ‘slick’ tyres on a very slippery track, Lloyd battled ahead of long-time leader Butcher as Glynn Geddie charged through to grab second place. In a race where the entire field started on slicks in the damp, and then had to cope with more rain mid-race, there was superb action throughout the field as drivers battled successfully to stay on track. In Pro-Am1, Al Harthy completed a perfect weekend with another victory, while Mann again scored maximum Pro-Am2 points after her first taste of racing in such conditions. Butcher is renowned for his pace in tricky conditions and he burst into the lead at the first corner, while Lloyd turned in a stunning opening lap to go from eighth on the grid to second place. Meadows slotted into third, while Geddie (Aberdeen) charged through from 11th on the grid to hold sixth place behind Jonas Gelzinis (Lithuania). Despite losing the splitter from the front of his car on lap five, Lloyd maintained a dogged chase of Butcher and his prayers for more rain were answered mid-race. That mitigated the loss of the splitter somewhat and allowed him to stay close to Butcher as Meadows held a watching brief in third and Geddie hunted them all down. Conditions mid-race were incredibly tough as the rain returned, but the driving standards were superb as Butcher fended off Lloyd. But Geddie was the big threat now, having demoted Meadows, and by lap 18 the leading trio were almost nose-to-tail. Out of Church corner a lap later, Butcher and Lloyd were side-by-side and they raced level up to the Chicane with Geddie close behind. Lloyd tried for the outside, but Butcher’s car snapped into a spin and Lloyd had to straight-line the Chicane to avoid contact. Butcher had given his all in supremely tough conditions and completed the podium as Meadows ran home fourth. “That was about Championship preservation,” said the pragmatic Meadows, who had wisely opted to make sure of another strong finish rather than take big chances. Barker and Gelzinis completed the top six. 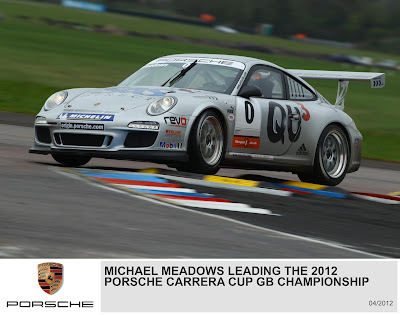 The next round of the 2012 Porsche Carrera Cup GB Championship takes place at Oulton Park, Cheshire, on June 9/10. This is the 300th Post on www.overdrive-uk.com! Round three of the MSA British Rally Championship, the Pirelli International Rally based in Carlisle, started on Friday night with two stages in the infamous Kielder forest complex. It was Jarkko Nikara who set the early pace in his Citroën DS3 R3, holding the overnight lead from an inspired Elfyn Evans in his R2 class Fiesta. Keith Cronin and Marshall Clarke however were just 0.8 seconds behind Elfyn, and contesting their first stages in their brand new Autosport Technology built DS3. 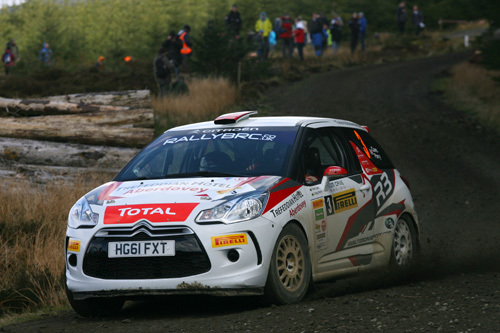 Early dramas were already in store however, and Bulldog Rally winner Tom Cave was back in his own DS3, but lacking confidence in his settings on the loose tracks. He was back in ninth place, but team-mate Osian Pryce suffered a spin on stage one, and a loose turbo pipe on stage 2. Worse was to come however as Osian retired with fuel problems on stage 4. Carryduff’s Jonny Greer limped to the end of stage one with a puncture losing vital seconds, but he gradually speeded up as he softened the suspension of his DS3 on day two and eventually finished tenth overall. Fellow Northern Ireland driver Desi Henry was also suffering, with a gearbox mounting breaking on stage one, causing them to tackle stage two stuck in third gear. More time loss followed on day two with a coil failure and a puncture on stage 14, costing minutes and their 16th place finish didn’t reflect their efforts on the stages when things were going well. Desi is still honing his gravel skills event by event, and despite the issues left the event happy that he had made some improvements on that front. 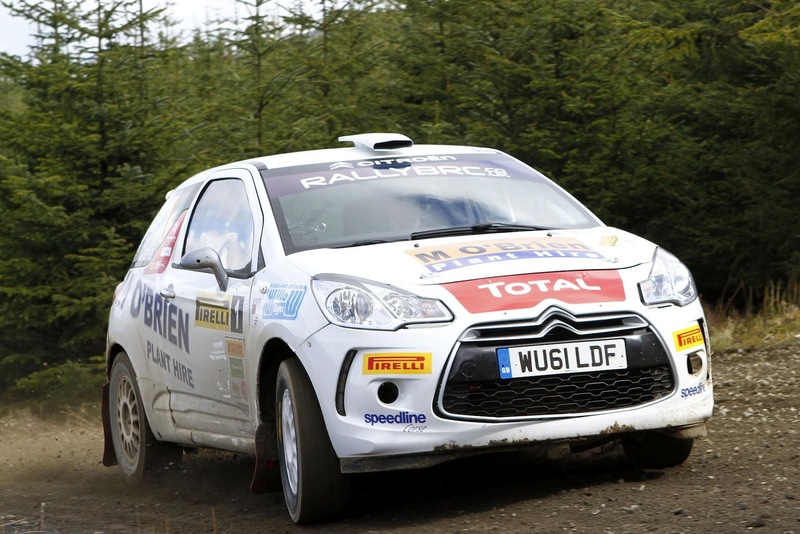 He also has the consolation of leading the Citroën Racing Trophy UK after three rounds. 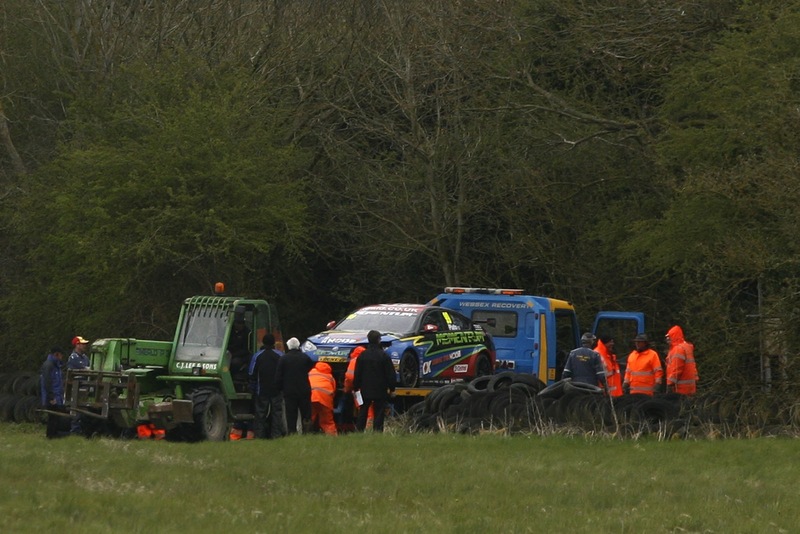 The drama continued on the Pirelli Rally as James Grint, slid wide and was stuck for seven minutes. James and co-driver Phil Clarke had to round up some spectators to get the car off the ditch and eventually ended the event in 18th place. The battle at the front however was set to escalate as Keith Cronin mounted an early morning charge. “It took me a while to settle in with the new car on the first night,” commented Keith. “The team did a great job to get the car ready and although we completed the shake-down, it wasn’t really representative of the stages ahead, so I was still adjusting the suspension a lot during the weekend. There was a lot of loose gravel on the top of the roads, so the cars were sliding a lot.” On the day’s opener he climbed ahead of Nikara, but the lead was to change again on stage 5, Keith suffered a deflating tyre and the ever sideways Nikara nipped ahead. However by the lunch time service halt it was Cronin who was back in the lead by just 1.5 seconds. In third place now was Mark Donnelly, the first round winner in his Clio R3, but Mark was happy to maintain that place, as the Renault was suffering a leaking shock absorber. Previous round winner Tom Cave just couldn’t get into the groove on the event, and ended the rally in 9th, but the race for victory was on as 8.2 seconds separated Cronin and Nikara going into the final stage. Upon the restart, former Ginetta Junior champion Adam Bonham took the lead into turn one. Soon after Josh Files made his move to take second but it was to be short lived as both Bonham and Files ran wide at Noble dropping Files to third and forcing Bonham to return to the pits. Paul Rivett made the most of the opportunity to take the lead. 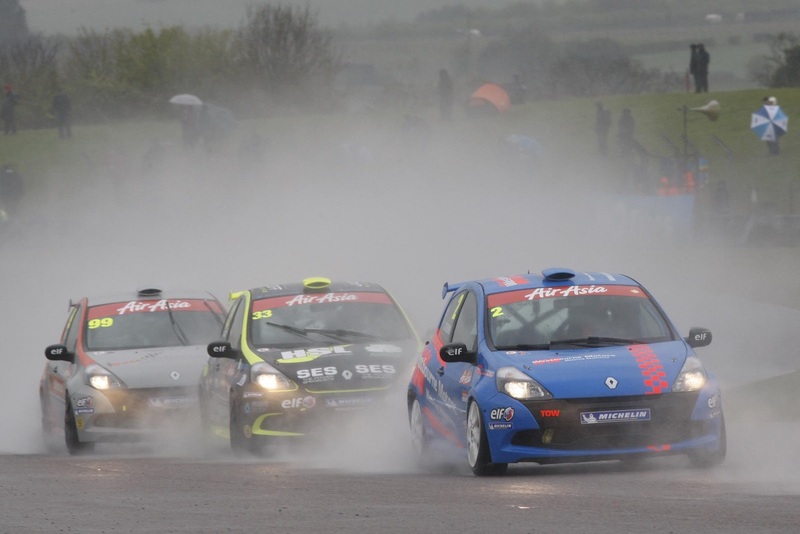 The increasingly wet conditions seemingly suiting the multiple Clio Cup winner, who is soon to make his debut in the P1 AquaX jet-ski championship. The first victims of the treacherous conditions were Total Control Racing’s Rob Smith and Saturday’s Rookie Cup winner Mike Bushell both meeting the barriers at speed due to standing water at Allard causing the release of the safety car. Three laps later, the safety car lights were off and the rain soaked race began yet again. Rivett lead down into turn one, Colburn in second and Team Pyro team mates Files and Jack Goff fighting for third position, closely followed by Josh Cook. With a five-car train battling for the lead, contact soon ensued between leading Rookie Josh Cook and Files, the latter spinning onto the grass forcing Files to rejoin down in 13th position. Up ahead, Rivett was able to pull out a short lead from second placed Colburn, but on the final lap, Colburn gained a good tow to pass the triple-champion into turn one, which he held to the chequered flag. “It was an absolutely great race,” said Rivett. “A second place but it was a shame I wasn’t quite able to hold on for the win. To be honest, I thought we were on the last lap and we weren’t so that being the reason as to why James got through. Scuderia Vittoria’s James Dixon had a quiet but positive race, starting from eighth, he made his way up to finish fourth and take the fastest lap. Cook, looking for his first Rookie Cup win of the season, was unable to hold his fourth position, losing out to fellow rookie and ex-Swedish Junior Ice Racing racer, Kim Andersson on the final lap. Also making progress from the start, Lithuanian Ignas Gelzinis finished seventh from eleventh, followed by Vic Covey who made up nine places from the grid to take the flag in eighth. In ninth was ex-rally driver Adam Gould recovering well from a spin on the opening laps. Rounding out the top ten was Finesse Motorsport Ltd’s 19-year old Aaron Williamson who made the most of the wet conditions to finish in 10th position having started in down in 23rd after struggling with mechanical problems throughout the weekend. Just behind Williamson and narrowly missing out on a top ten finish, Scotsman Finlay Crocker came home in 11th place to take the ELF Masters Trophy, 4.958secs ahead of Saturday’s Masters trophy winner Simon Belcher in 12th place. Having had two top ten grid positions, Total Control Racing’s Nicolas Hamilton had a mixed weekend in the difficult conditions, spinning twice in the second race concluding his day in eighteenth place. Warwickshire’s Mat Jackson and Fife’s Gordon Shedden, the latter with a victory double, shared the wins in today’s three rain-soaked Dunlop MSA British Touring Car Championship races at the high-speed Thruxton circuit in Hampshire. Oxford’s Jason Plato continues to lead the points table but only just from new second-placed man Shedden as Britain’s premier motor racing championship now heads to the spectacular Oulton Park circuit in Cheshire for its next three races on the weekend of 9/10 June. Staffordshire’s Andrew Jordan had headed Saturday’s qualifying session to line up on pole position for the first of today’s races. 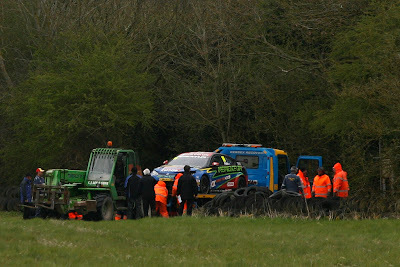 But it all went wrong for the Pirtek Racing driver at the first bend as his Honda Civic tangled with Plato’s MG KX Momentum Racing MG6 and crashed. This left the way clear for Jackson to reel off his second win of the season in his Redstone Racing Ford Focus ahead of Inverness’s Dave Newsham in his Team ES Racing.com Vauxhall Vectra and Plato. Newsham’s second place was the best of his career so far. Having started from lowly 18th and 19th spots after a disastrous qualifying session, Shedden and team-mate Matt Neal, the reigning Champion, were sixth and tenth. Shedden was unstoppable in race two as he quickly made up positions to pass Jackson for the lead and a comfortable win. Plato took second ahead of Jackson in third. Neal was fifth. In race three Shedden and Neal then simply romped clear of the opposition to give Honda a dream 1-2 result. Third, adding to earlier fifth and fourth place results, was the impressive Frank Wrathall in his Dynojet Toyota Avensis. Plato was fourth. As a result, Plato leaves Thruxton holding a four-point lead from the charging Shedden. Next up are Neal, Jackson and Hampshire’s Robert Collard who, on his home track, took a fourth and two seventh places today in his eBay Motors BMW. Meanwhile, Honda/Dynamics and the Honda Yuasa Racing Team have extended their respective leads in the Manufacturers/Constructors and HiQ Teams championships respectively. Jackson and Redstone Racing have taken over at the top of the Independent Drivers and Teams standings. Elsewhere, two drivers were today penalised for on-track incidents. Redstone Racing’s Liam Griffin was handed a time penalty in race three which relegated him from 11th to 12th place while team-mate Aron Smith was officially reprimanded and had two penalty points added to his competition licence for an incident in the previous round at Donington Park. A determined performance by 20 year-old rally driver Tom Cave saw a useful haul of points for the MSA British Rally Championship on this weekend's Pirelli International Rally, despite the Welshman not finding a set-up for his Citroen DS3 R3 which allowed him to confidently attack the stages in the fabled Kielder forest. 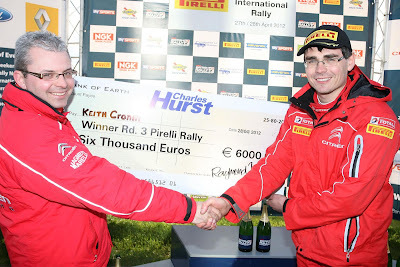 He and co-driver Craig Parry eventually finished the event ninth overall, fifth in Class 5 and claimed ten points for the championship in the process. Tom was understandably bullish approaching the event, following a dominant win on the previous round, the Bulldog Rally. A short pre-event test gave what he and the Tom Cave Racing team thought would be a good wet set-up for the Pirelli but as it transpired, this was not the case. The event began with two stages run on Friday evening and immediately, the Citroen was showing excessive oversteer and with it, a lack of confidence for Tom. He made several changes to the settings for the first loop of stages on Saturday morning but again, these did nothing to improve the car's stability and as a result, his confidence. Further changes were made in consolation with the attending Citroen engineers but again, these were ineffective and the car remained extremely nervous on the long, fast straights that made up many of the stages. The net result was that Tom simply had no confidence in the car and was unable to push for a better result. By the mid-point of the day, he and Craig decided that discretion was definitely the better part of valour and they adopted a pace that would see them to the finish of the event, without pushing to claim a better position and risk throwing a useful points tally away. Commenting after the event, Tom said: "It was a very disappointing and frustrating day. We just couldn't get the right set-up that would give me any confidence in the car whatsoever and allow me to push. "The car itself ran faultlessly, we just couldn't get it set up right. It started with too much oversteer on Friday and was incredibly nervous and unstable on the higher speed sections. And in Kielder, that's the last thing you want. We tried various options, including those suggested by the Citroen engineers at the event but it just wasn't happening. "I couldn't get my head round what the issue was and as a result, had no confidence in the car and knew that if I tried to push, it would have gone wrong in a major way." Tom's next potential event is the Jim Clark Rally, the fourth round of the BRC, pending securing financial support. However, he clearly understands that in order to succeed, he needs more seat time in the car and is considering using the prize money from his win on the Bulldog and from the Pirelli to contest an event in Ireland as a pre-event warm-up for the Jim Clark and potentially, the Ulster Rally in August. "It's clear from this event and the Bulldog that when everything gels and works together, then the speed and potential results are there," he said. "However, we can't be at the front unless this is the case. I think that if we had a good set-up with the car this weekend, then we could have done better but there's little point in focussing on 'What ifs'. "What is obvious is that we need to up the game if we're going to succeed in the BRC. I'm just glad that we stuck with it this weekend and managed to get enough points to stay towards the front of the championship." Tom is now second in the overall championship standings. Tom is considering the feasibility of contesting the Carlow Stages in Ireland on the 13 May, having been unable to get an entry on this year's Isle of Man Rally, as the entry list is full. Andrew Jordan has taken pole position for the first of tomorrow’s three Dunlop MSA British Touring Car Championship races at Hampshire’s high-speed Thruxton circuit, but there were major problems in this afternoon’s qualifying session for three of the series’ big names, Gordon Shedden, Jason Plato and Matt Neal. 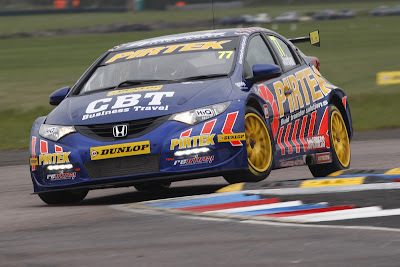 Staffordshire’s Jordan, driving a Pirtek Racing Honda Civic, set the pole position time in 1m16.983s – a dizzying average speed of 110.17mph. It is the second pole of the 22-year-old’s career. Oxford’s Plato, the current championship leader, ended up second overall but had to rely on the time he set earlier in the session as he then crashed at high speed in his MG KX Momentum Racing MG6. Preston racer Frank Wrathall, another of the championship’s rising young stars, was a career equal-best third fastest on a damp but rapidly drying track in his Dynojet team’s Toyota Avensis. Meanwhile Mat Jackson (Redstone Racing Ford Focus), Dave Newsham (Team ES Racing.com Vauxhall Vectra) and local Hampshire ace Robert Collard (eBay Motors BMW) were next up to make it six different cars in the top six positions. 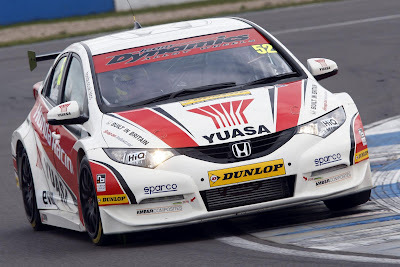 But having looked supreme in morning practice, it all went wrong for the factory Honda Yuasa Racing Team team-mates Neal and Shedden in qualifying. Neal finished up a lowly 19th after a crash and Shedden, on course for his first pole of 2012 having set the fastest lap, then had all his times disallowed mid-session when it was discovered his car had exceeded the permitted turbo boost limits. He rejoined the session for one final flying lap but a costly error meant he could do no better than 18th. Tomorrow’s three BTCC races at Thruxton will be shown on ITV4, ITV4 HD and www.itv.com as part of its mammoth live broadcast of the event (11.00am-6.00pm). 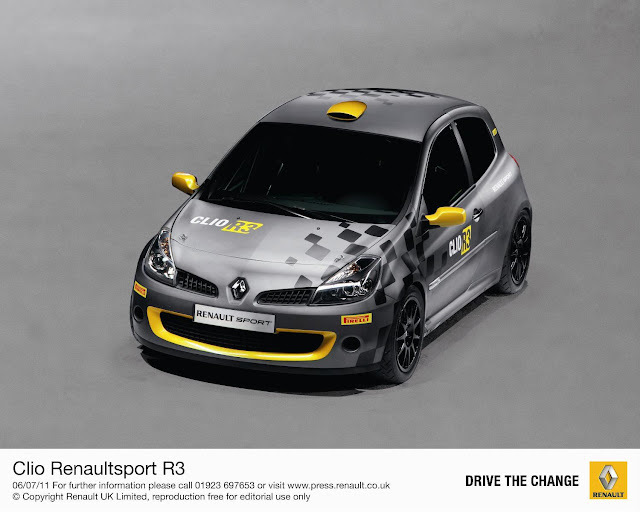 Renault's R3 Rally car... Mud Optional. Northern Ireland’s Mark Donnelly and Welsh co-driver Dai Roberts lead Renault UK’s assault on the MSA British Manufacturers Rally Championship on this weekend’s Pirelli International Rally. Undeterred after a high speed crash in Wales and after a huge effort by his team to repair the car, the youngster will pilot his 250HP Clio Renaultsport R3 in an attempt to emulate his stunning first round victory on February’s Rallye Sunseeker International. However, Renault’s second position in the manufacturers’ tables is not just down to one driver, as the top two cars from each of the registered marques score on every event. It was Cumbria’s Peter Taylor, accompanied by Newcastle’s Andrew Roughead, who bagged top Renault UK points in Wales, having ably assisted Donnelly to put Renault atop the tables in Bournemouth. The affable 20 year-old should arguably arrive at the Carlisle start most refreshed, living just ten miles from the Carlisle Racecourse rally HQ. Nick Allen could argue that he has travelled the furthest to contest the infamous Kielder Forest stages, although it has been several months since the Californian left San Francisco to take part in the 2012 British Rally Championship. Now living in the north east of England, it was he and Solihull’s Andy Bull who helped keep Renault UK’s manufacturer title hopes alive, second Renault home on round two of the BRC. Driving a brace of Twingos, Chris Ingram and Garry Pearson might be fighting for their respective R2 and R1 Twingo Trophies, but they are keen to be involved in the fight for Manufacturers’ honours and will push as hard as they dare this weekend. The Pirelli International Rally gets underway with a parade of cars in Carlisle City Centre this Friday (27th April) from 5pm. Drivers will be on hand from 6pm to sign autographs and the flag drops from 7pm before two evening forest stages. The bulk of the mileage takes place on Saturday, finishing around 7pm back at the rally’s headquarters at Carlisle Racecourse. The MG KX Momentum Racing team heads to Thruxton this weekend for rounds seven, eight and nine of the 2012 Dunlop MSA British Touring Car Championship (BTCC). It has been a busy start to the season for the championship leaders, with the first three race weekends all falling in April. The team is looking for a strong weekend, with the BTCC taking a six week break before the next instalment of the season at Oulton Park. The Thruxton circuit in Hampshire is the fastest circuit on the 2012 BTCC calendar, with the average speed of the qualifying lap record being in excess of 111mph. 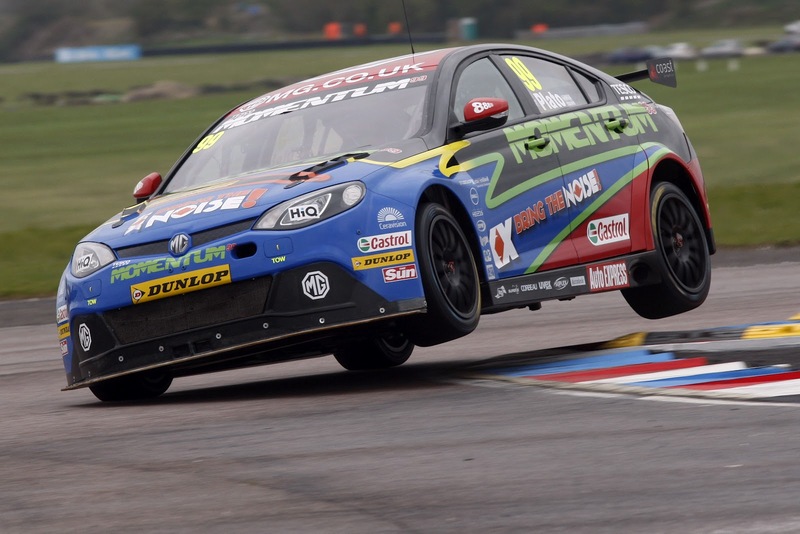 The high speed nature of Thruxton means that championship tyre supplier Dunlop has to produce a special edition tyre, that is capable of enduring the high loads the tyres are put under during the weekend’s competition. 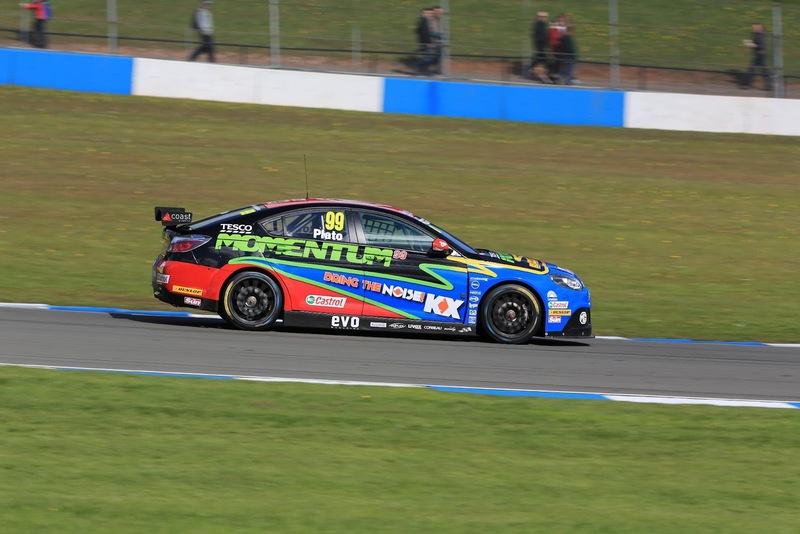 Thruxton has been a happy hunting ground for the Greatworth based Triple Eight Race Engineering squad with the team having won nine of the last fifteen BTCC races held there. The MG KX Momentum Racing team will be hoping the new MG6 can enjoy similar pace around Thruxton to the team’s Vauxhall predecessor. The flat out curves of Thruxton ensure that the Hampshire venue is a favourite amongst the BTCC drivers and both MG KX Momentum Racing drivers are relishing the opportunity to get back behind the wheel of their MG6 race cars this weekend. Neal and Shedden have already taken victories in the first season of the NGTC Honda Civic, and Thruxton provided a great weekend for them in 2011. 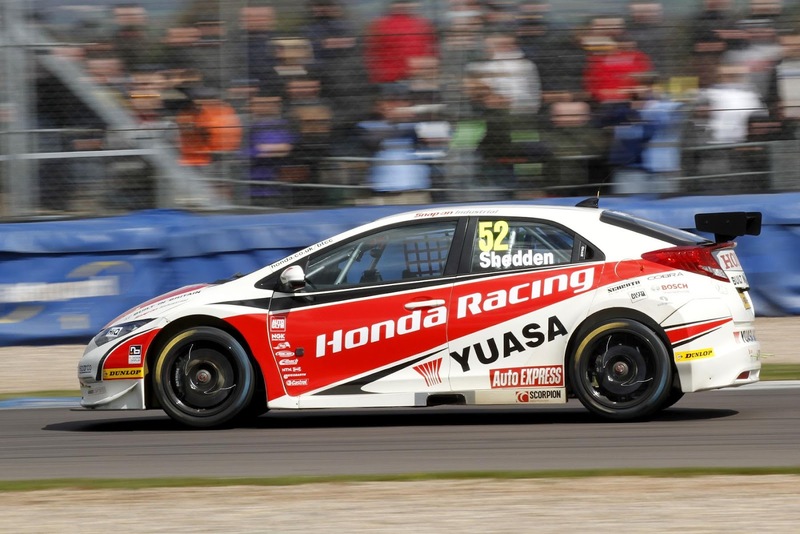 Shedden led a Honda one-two in race one last year, while Neal returned the favour in the second encounter. Thruxton is a test of speed over handling - Dunlop has even made special tyres! 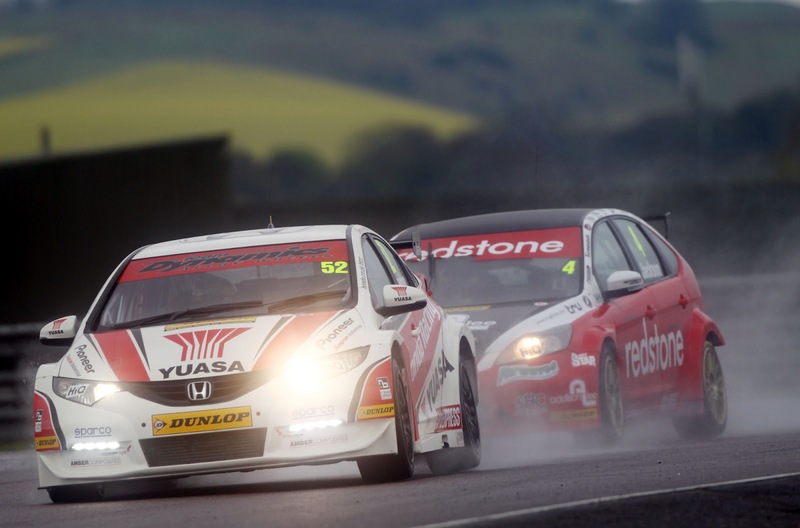 Shedden, who currently lies fifth in the standings while Neal sits in second, is certainly a Thruxton fan. “I’ve had some great results there and some terrible times with punctures,” he said. “It’s always been exciting! Despite BTCC rules limiting the Honda’s turbo boost and restricting their straightline speed, many other cars have been allowed more boost for Thruxton under the championship’s lap-time equalisation regulations. Shedden hopes the Civic’s fine chassis will help negate the disadvantage. The high-speed Hampshire circuit is notoriously hard on tyres too, and Dunlop has produced special rubber for the event. Despite suffering no problems last year, Shedden believes the switch to the NGTC Civic creates an unknown. “It’s a completely different beast, so it’s a clean sheet of paper really,” he said. “It’s a different tyre and we don’t know how the set-up will work with it. Despite a mixed history with the circuit, Neal also likes racing at Thruxton. “It’s never been a happy hunting ground for me, but I love it,” he added. “It’s unspoiled and is a big-commitment circuit. The Thruxton action gets under way at 09:30am on Saturday with free practice. Qualifying is at 3:20pm, and the first of three races on Sunday is scheduled for 11:37am. 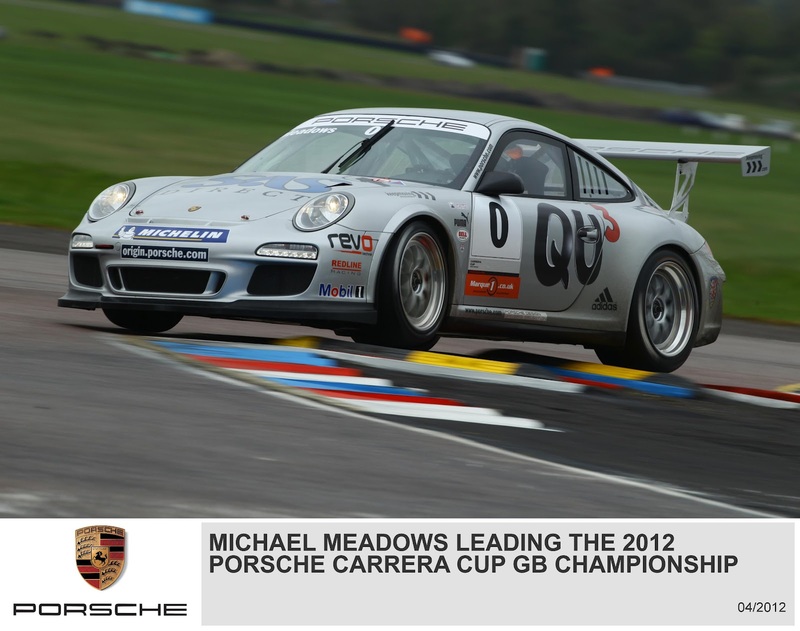 With three wins from four races, Michael Meadows is setting the standard in the Porsche Carrera Cup GB as the focus switches to the high speed sweeps of Thruxton this weekend (28/29 April). The Hampshire track comes at the end of a busy period of three weekends and six races in five weeks. Thruxton is the fastest track on the calendar for the 450bhp 911 GT3 Cup cars, with a lap record at more than 113mph, and the notoriously abrasive surface at the Hampshire track always offers the potential for unpredictable races. April has been a very good month so far for Redline Racing’s Meadows. With a busy start to the season, it was vital to hit the ground running and Meadows has done just that. Currently, the Banbury racer has an eleven-point championship lead but he knows well enough that one non-finish will wipe that out, and more. However, if Meadows maintains his current form through the Thruxton weekend, he will go into the six-week break until the next races with an advantage in both points and psychology. Ominously for his rivals, Michael set the pace in pre-race testing at Thruxton before Easter. Leading the chase of Meadows right now is Lithuanian racer Jonas Gelzinis (Juta Racing) and he has been on the podium every time out so far. Gelzinis has the natural speed to take the fight to Meadows and a debut overall Carrera Cup victory in Hampshire would be a major boost to his title ambitions. Three fine young racers from Yorkshire pack out the front end of the grid for Team Parker Racing and it is Richard Plant who bagged victory in the opening race at Brands Hatch when Meadows was penalised for running wide. However, Plant has had a run of poor fortune since then and will be determined to get back onto the podium. 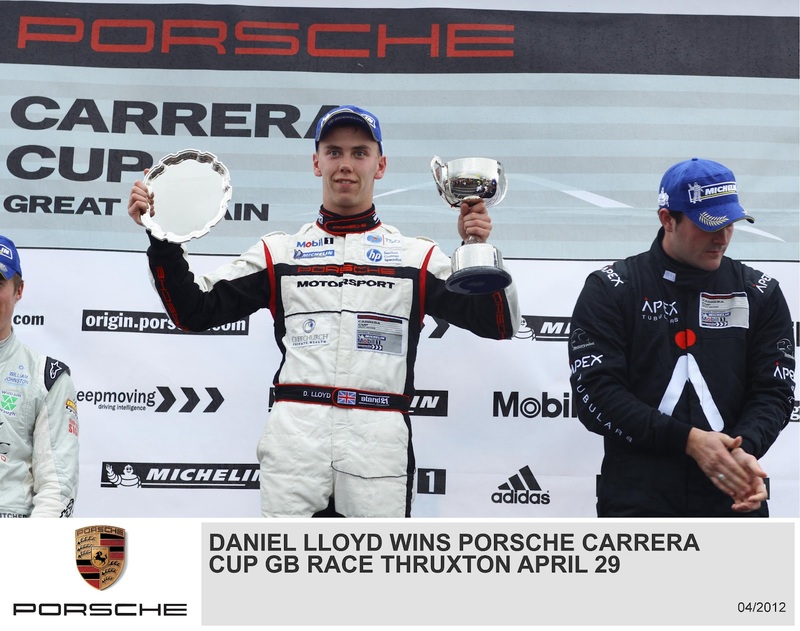 Sam Tordoff will be right up there and so, too, will be Carrera Cup Scholarship racer Daniel Lloyd who has already starred with two podiums and some mighty performances. Ben Barker (Parr Motorsport) will be eager to bounce back from a shunt last time out at Donington and get back onto the podium as he races at Thruxton for the first time, while Glynn Geddie (Redline Racing) and Rory Butcher (Celtic Speed) fly the St Andrew’s cross in style. Heading to Thruxton, Ahmad Al Harthy (Redline/Oman Air) has built a handy 15-point lead in the Pro-Am1 category after an impressive double win at Donington. Derek Pierce (JD Pierce with Team Parker) stands out as the big challenger to Al Harthy at this point of the season, but a gaggle of other quick drivers are all chasing a share of the Pro-Am1 glory. The hard-charging Michael Leonard (Naas Court Hotel with Parker), Oly Mortimer (GT Marques) and Spanish racer Victor Jimenez (Redline/Oman Air) are all podium contenders, while George Brewster (Celtic Speed) and Liphook’s Keith Webster (Redline/Marque 1) add to the depth of quality in the category. Pro-Am2 is headed by Carrera Cup newcomer Tania Mann (SIBSport) and the Australian lady is showing impressive form as she learns about racing at this level. Her main rival should be Lithuanian businessman Tautvydas Barstys (Juta Racing). After qualifying at 14.35 on Saturday, round five will start at 12.20 on Sunday, with round six at 16.25. Both races are due to be broadcast live on ITV4 during the extensive BTCC programme. Having already twice wowed the nation live on TV with their wheel-to-wheel antics in 2012, the stars of the Dunlop MSA British Touring Car Championship will surely be tested to their limits this weekend (28/29 April) when they contest their latest three races on Hampshire’s high-speed Thruxton circuit. Thruxton is the fastest track on the calendar for the teams and drivers of Britain’s premier motor racing championship with cars running bumper-to-bumper at close to 150mph. Furthermore it is the only time this year that the BTCC will visit the region making it a must-see event for motor sport and motoring enthusiasts from across the South and South West in particular. Thruxton is also within easy reach of the Midlands, South Wales and London thanks to its proximity to the A303 dual carriageway which provides swift links to the M3, M4, M5, M25, M27 and A34 motorway network. And with the added presence of ITV4’s live cameras covering the event, its big BTCC weekend is truly both a major sporting and social occasion. The opening six races of 2012 have produced no fewer than five different winners – Jason Plato (MG KX Momentum Racing MG), Matt Neal and Gordon Shedden (Honda Yuasa Racing Team Honda Civics), Robert Collard (eBay Motors BMW) and Mat Jackson (Redstone Racing Ford Focus). It is Plato who will arrive at Thruxton leading the standings but only by a slender margin from reigning Champion Neal, Andrew Jordan in his Pirtek Racing Honda, Collard, Shedden and Jackson. For the record, former double Champion Plato also boasts an unrivalled 69 career race wins with three of them having been achieved at Thruxton. Meanwhile Collard is very much among the local heroes. Both he and team-mate Nick Foster hail from near Hook, Hampshire. Collard will also be going into the event very likely with a few aches having run in yesterday’s London Marathon! Fleet-basedWelch Motorsport with its Proton Persona driven by Daniel Welch will be looking to impress on home ground as well. In all some nine different makes – Audi, BMW, Ford, Honda, MG, Proton, Toyota, Vauxhall and VW – are represented on the grid, meaning plenty of variety for the race day spectators to choose a favourite. Tickets for the event remain available at discounted prices – just £25 for race day (Sunday) – while general admission is FREE all weekend for accompanied children aged 15 and under. Admission also includes access to the BTCC pit lane on Sunday morning when fans can meet the drivers during a specially arranged autograph session. 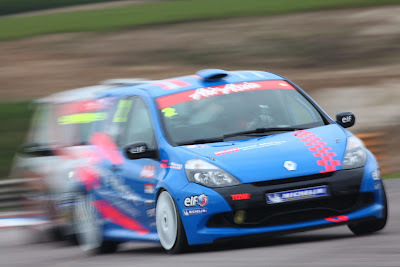 For more details call the ticket hotline 01264 882200 or visit Thruxton’s website www.barc.net. 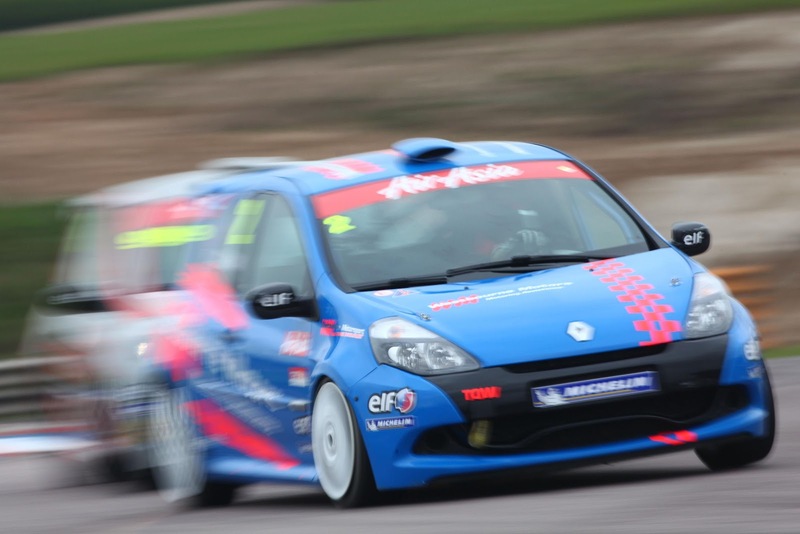 Meanwhile Thruxton’s BTCC weekend (28/29 April) includes 12 races in all – three for the touring car grid plus further exhilarating action from the supporting Ginetta Junior, Ginetta GT Supercup, Porsche Carrera Cup and Renault Clio Cup grids. On the Clio Cup grid is Nicolas Hamilton, brother of Formula 1 hero Lewis Hamilton. Tom Cave in action on the Bulldog Rally, but could Sponsor issues force the championship leader out of the competition? The current leader of the 2012 MSA British Rally Championship, Tom Cave, is heading for the third round of the series, the Pirelli International Rally in a bullish mood after his first international rally win on the previous round. And he is refusing to allow the loss of a major sponsor to affect his plans for the event, even though the rest of his season now hangs in the balance. Following on from his exceptional performance on the Bulldog Rally in a rented car, Tom and the Davies Motorsport Services team have rebuilt his Citroen DS3 R3, which was damaged and thought written-off following component failure on its first test last month. A steering component broke after a small jump and the car came to rest submerged in a pond at the Sweet Lamb venue in Wales. However, after it was confirmed that the initial offer to cover the costs of the rebuild had been withdrawn, Tom and DMS were delighted to find that the damage was not as bad as first thought. Once the car had been dried out and the centre control unit within the cockpit changed, the engine fired first time and the major systems appeared undamaged. The only other component which required changing was the radiator and the car was ready for a shakedown test using parts which formed the included spares package. A short test demonstrated that the DS3 was back to form and Tom is now looking forward to another pre-event test where he hopes rain will feature, so that he can develop a wet weather set-up for the car, since he is happy with the dry settings he developed for the Bulldog. However, he suffered another blow when his major sponsor confirmed it would not be able to continue to support his 2012 BRC campaign. While Tom has sufficient funds for the Pirelli International, he finds himself in the unenviable situation that without securing additional support, his season may well be over halfway through and potentially, with him leading one of the world's most prominent national rally championships. Commenting, Tom said; "I and the DMS team were so pleased when the engine fired up for the first time and we realised that it was OK. We'd spent a fair bit of time to get to that point and frankly, if the engine needed rebuilding, I think that would have been the end of the season. But it didn't and we had a short shakedown test yesterday [Wednesday] to make sure the car worked. "We've now got a proper pre-event test at the Higgins facility in Wales before we head north for the Pirelli. I really hope the weather is wet, as I need to get a good wet set-up of the car. I'm really happy with the dry one we have, from the Bulldog but if the conditions are typical Pirelli, then I'll need that information. "I think the goal for the Pirelli is a podium finish - if we finish in the top three, then hopefully we'll maintain the lead in the championship. But of course, after the Bulldog, I'd be lying if I said I wasn't aiming for another win. Everything seemed to come together on my 'home' round and the result showed what I have felt for a while - when we manage to shake off the bad luck, we can get a good result. "Of course, it's entirely possible that the Pirelli could be our last event in the BRC this year. Our main sponsor isn't able to continue with us, which is a real shame. I can just about fund the Pirelli myself but after that, the cupboard is bare, so to speak. We're in discussions with several possible sponsors at the moment but without support, I don't think we'll be able to do the Jim Clark, let alone the rest of the championship. "With all the bad luck we've had over the last couple of years, it's unbelievably ironic that this happens when we're leading the British Rally Championship! But we'll carry on as best we can." The two-day event is based at Carlisle Racecourse and features two stages run on the evening of Friday 27 April with a further ten stages on Saturday 28 April. The first crews are expected at the finish at 7pm.